Sometimes it is necessary or desirable to connect power between cars and locomotives. A battery in a box car can be connected to a locomotive to allow battery powered operation. A string of lighted cars will need a source of power from somewhere if the cars themselves have plastic wheels. Cars with track powered lighting will experience little or no flickering if power pickup is shared down the length of the train. Multiunit engine lashups will experience less power pickup problems, especially on dirty track, if the engines are interconnected. There have been many methods used to interconnect power between cars. Here are some of them and their advantages and liabilities. Polarized connectors are desirable to prevent shorts, but then individual cars cannot be turned around because the connectors won't mate. Sub miniature polarized connectors are available but are hard to find. The connectors are somewhat unsightly and expensive. The connectors tend to fall out easily. On some equipment, the connectors are connected to track power, some other equipment sources 5 volts on these connectors. 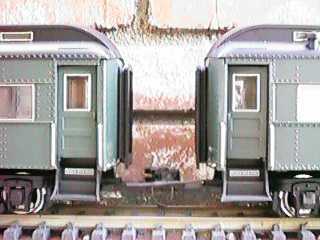 If the wires are properly anchored, the connectors will pull apart without damage when the cars are uncoupled. I've settled on the "D" connector contact pin for interconnecting my engines and cars in consists that are fairly dedicated such as passenger trains. The only reason for doing it is I want my equipment to be very tolerant of dirty track. Even though track cleaning isn't very difficult, any hassle detracts from the enjoyment of running my trains. So in the spirit of CPI (Continuous Process Improvement) instead of fighting a natural problem, I make my trains resistant to the problem. I have found that even if a pair of engines is crossconnected, power pickup is significantly improved. Often the engines running separately will spit and sputter, but when connected, the lights won't even flicker. I could also eliminate track cleaning problems altogether by converting to battery power, but I run multiple engines, often with lots of lights and smoke so that batteries just won't last. Dead and dying batteries are a hassle too. The photo shows the connection between a pair of Aristo Heavyweights. The contact pins are covered with shrink tube so that they are insulated. A male and female contact pair are used on each end of a car such that if the car is turned around, the contacts will still line up. The wires are simply soldered to the existing lugs that connect to the power pickups on the trucks. 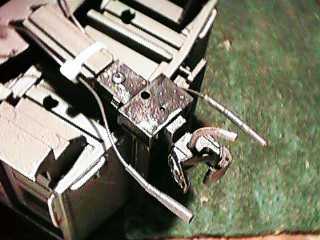 In this photo you can see a pair of wires leading from the loco body. These are power pickup jumpers that I use to cross connect an FA-FB-FA set for 24 wheel power pickup. I could have also connect these wires right to the power pickup strap in the truck sideframe, but I didn't have any lugs small enough. On the next conversion, I'll do it that way so that I don't even have to take off the shell to install the connectors. Installation of the connectors is easy. All you need is some 22 or 20 GA black wire, some connector contacts and some 3/32" black heat shrink tubing. I use wire that is fairly stiff so that an unconnected connector will support itself and not drag on the track. You should select machined contacts instead of formed contacts. Machined contacts are fully round and are more expensive, but they are still less than $0.25 each. The much less expensive formed contacts are folded up from a sheet and have much poorer mechanical characteristics such as contact retention force. These contacts can be found in most electronics stores as the insertable contacts for the standard DB-25 type connector. 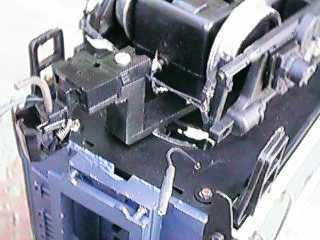 The military designation for this connector and contact system is MIL-C-24308. This diagram shows how the connectors should be arranged on a car. Notice that if the car is rotated 180 degrees, the connections are identical. To assemble the connector, solder an appropriate length of wire to each contact. Then cut a 1" piece of shrink tube and cover the female contact all the way to the end and shrink the tubing with hot air. A 1200 watt hair dryer will usually work. You can shrink the tubing over a lit match or with a soldering iron tip, but be careful that you don't burn the tubing. Then insert the male contact into the female contact and place another 1" piece of tubing over the pair so that the tubing goes at least as far as the end of the male contact and shrink only the part that covers the back half of the male contact. Leave the part that overlaps the female contact unshrunk. Then separate the contacts and trim the tube on the male contact even with the end of the contact. Trim the wires and solder them to the appropriate points on your engines or cars. I use a small cable tie to attach the wires to the sides of the truck mount coupler tang so that the wire is firmly held in place, but still can be pulled either way to adjust its length.